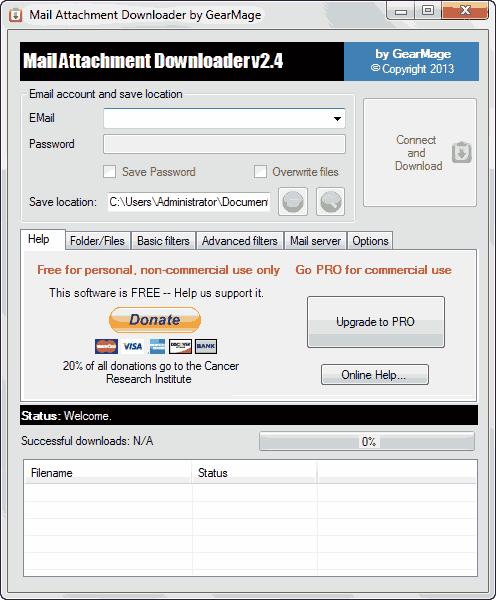 Mail Attachment Downloader is a free application developed to download all the attachments from your email account to your local drive on a mouse click. The application is only available for Windows devices. It works with Gmail, Google Apps, Windows Live Hotmail, AOL and Yahoo! Mail Plus accounts. There are many filters available within the application that allow you to setup different search filters to selectively download the attachments. Another prominent feature is that you can set the application to automatically download new attachments either daily, hourly or after every x hours and y minutes. This application does not alter your original emails, the unread emails remain unread and the read emails remain read, but the attachments are downloaded on schedule whatsoever. Launch the Mail Attachment Downloader and login with your email ID and password. Then click the Connect and Download button. Now the application will connect to your email account and will search for any emails in it. If you have set-up any filters, then the application will search for attachments in those emails only that match your filter. As soon as the application finds new attachments, it will start downloading them to your local folder. You can change the location of the local folder in which you want to store the downloaded attachments by altering the path in the Save Location field. Folder/File: You can select the folder (like Inbox, Personal, etc) from your email account, then Mail Attachment Downloader will download all the attachments of that folder only. You also get the option to save the subject, from, file name, date etc. of the messages whose attachments are being downloaded. Basic Filters: You can specify whether the attachments that are to be downloaded need to be searched in new messages or from all the messages. Additionally, you can also mention particular file types and this app will download only those kind of files. Suppose if you want only .doc files to be downloaded, then under this option you need to check the Documents option. Advanced Filters: This is the menu where you can specify the starting date and the ending date for the emails you want to download attachments from. Then this tool will download all the attachments of those mails only. Another thing you can specify here is the From, To, Subject, Body fields. This will then force the program to download attachments from only those emails which meet the fields you select. Mail Server: This option allows you to select the mail server you own the account with. The application support all the popular email providers like Gmail, Yahoo, Outlook, AOL besides others. Options: In this menu you can specify the interval after which the application will check for new attachments. You can also make the application run at startup within this menu. This tool is great to keep all your email attachments on your local drive. These files will come handy when you don’t have an active internet connection nearby.